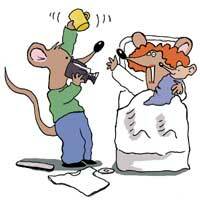 As Mrs. Rat's due date drew near, the Rat household went into full-blown nesting mode. The mother-to-be paged through catalogs of baby furniture while the whiskered one ran the wiring for a webcam in the nursery. She registered for baby gifts at department stores. He tried to do the same at his favorite retail establishments. The wirebiter had heard through his network of sources that his co-workers were planning a baby shower, but he was not getting his hopes up for a desirable gift. When the office staff had thrown a wedding shower for one of his acolytes, they had wasted many hours rigging the plumbing to drench the break room before the Rat explained the concept more completely. Accordingly, the cyberrodent tried to lower Mrs. Rat's expectations about her festive summons to his office. But nothing could have prepared her for what awaited. One of the Rat's colleagues had catered the affair'from the break room vending machines. A table held the sumptuous spread of corn chips, potato chips and Funyuns still in their bags. Rubber gloves from the cleaning closet had been inflated, tied and hung by tape from the ceiling. Gifts were stacked atop a table in the corner, many wrapped in old copies of GCN that had been on the Rat's desk the day before. One bore a bow tied from color-coded network patch cables. But the Rat was touched by the thought. 'Wow, guys, you shouldn't have put yourselves out,' he said, as his better half ripped through a Tom Temin editorial. Several trade show Linux stuffed penguins later, he began to wonder if he had spoken too soon. 'Wire ties,' a PC technician blushed. The webmaster presented his gift in an envelope. 'Oh, a gift certificate for Diapers.com,' she said, appreciatively handing it to her husband. 'Too bad they're only available in Washington state,' she whispered. At least it's more stimulating than a blue screen of death, the Rat mused silently.